The analysis is not the first evidence of Warren’s heritage. An 1894 document previously unearthed by the New England Genealogical Society suggested Warren’s great-great-great-grandmother, O.C. Sarah Smith, was at least partially Native American, making the senator as much as 1/32nd Native American. Cherokee Nation Secretary of State Chuck Hoskin Jr. said DNA tests are useless to determine tribal citizenship and don’t distinguish whether a person’s ancestors were indigenous to North or South America. Warren acknowledged in a tweet that DNA and family history have nothing to do with tribal affiliation or citizenship, which is determined by tribal nations. “I respect the distinction, & don’t list myself as Native in the Senate,” she said. 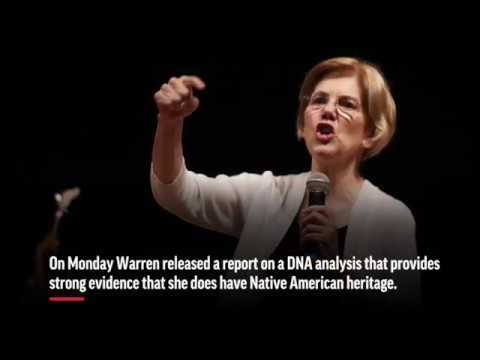 Warren’s effort to address questions about her ancestry and the release of the video are her latest moves telegraphing a likely presidential run in 2020. During the summer, she also released a decade’s worth of tax returns, drawing a contrast with Trump’s unwillingness to release his own tax documents. Warren responded with a series of tweets, suggesting that Trump’s comments are “creepy physical threats,” the kind he makes toward women who scare him. Warren tweeted Trump is a “cowardly elitist” and she “won’t sit quietly for Trump’s racism” so she took the test.